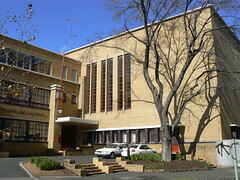 This is Kanimbla Hall, a piece of Sydney confection at 19-19a Tusculum Street, Potts Point. 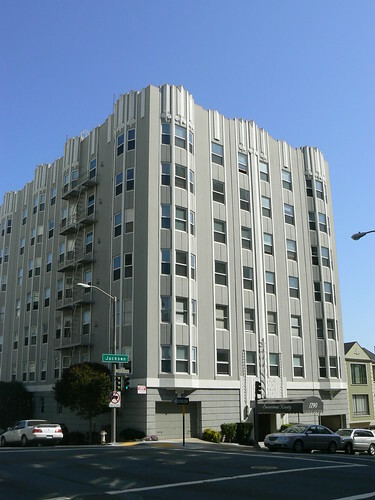 Unfortunately I don't know when it was built or who was the architect but it is a large residential block with a simple roofline and curved section on the corner of the building. 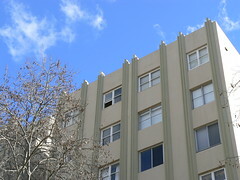 At nice touch, I presume added at a later date, are the metal bars on the ground floor windows are in a sunburst pattern. As are the fence and gates at the garden area between the wings of the building. 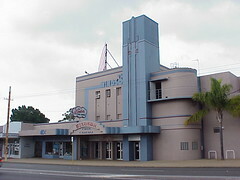 The Windsor cinema, on the Stirling Highway in the Perth suburb of Nedlands was built in 1937 and I am pleased to see it is still in use today. The cinema was designed by W T Leighton and featured a movable projector which could screen films into the adjacent picture garden. An old idea that has been reinvented in the 21st century with various open air and roof top cinemas but unfortunately I doubt The Windsor still has a picture garden. 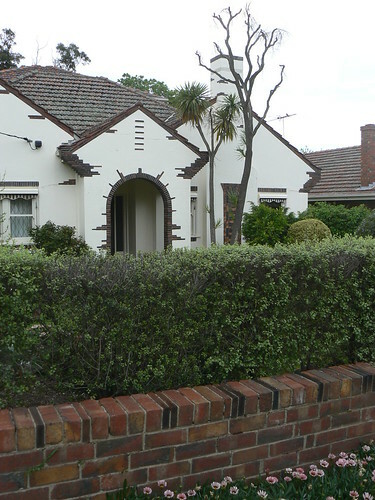 Here's another house from the Golf Links Estate in Camberwell. 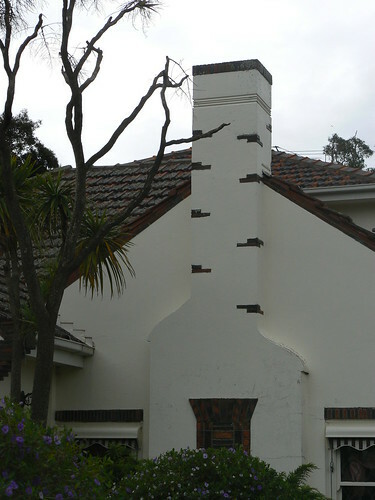 I love the decorative brickwork on this house. In particular around the arched entrance, on the eaves and, as you can see below, on the chimney. In 1934, when Victoria was celebrating its Centenary, industrialist and philanthropist, Macpherson Robertson, provided £100,000 for public works. Victoria was in the grip of depression and his generosity was aimed at providing both work and new facilities. 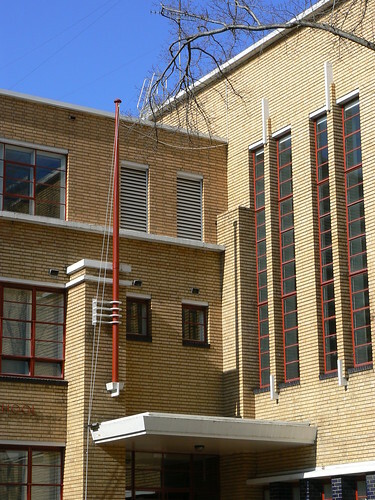 One of those new facilities was Mac.Roberston Girls' High School in South Melbourne. Mac.Rob, as it is often called, was designed by Norman Seabrook who later formed a partnership with Alan Fildes. One of my favourite aspects of the building is the red framed widows on the ground floor, below the auditorium, separated by pillars of blue bricks. 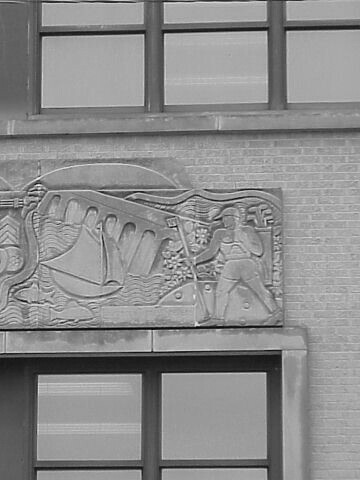 It looks stunning against the the cream bricks of the rest of the building. 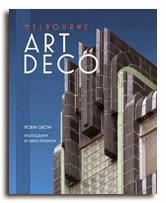 And the Art Deco 'rule of three' is proven with this exception. The flagpole has four supports! 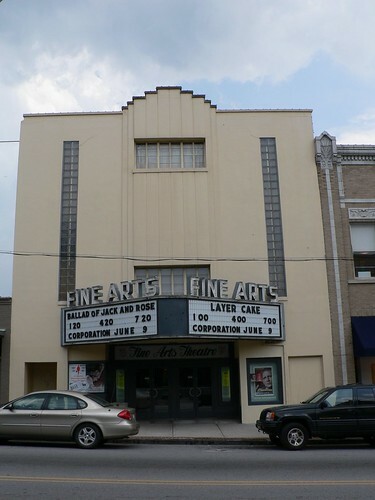 Originally opened in 1946 as the Strand Theatre and having survived the 1990s when it showed Adult films, the Fine Arts Theatre in Asheville, NC nows shows first run art and independent films. 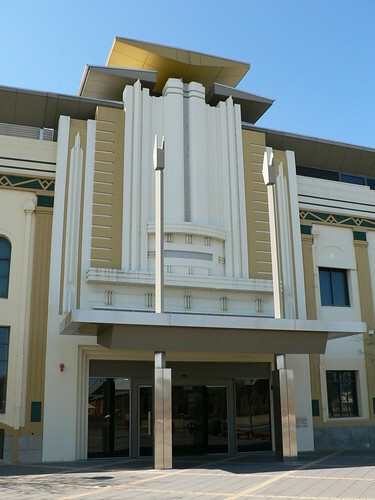 Like many public buildings, the Hindmarsh Town Hall has a long history of rebuilding, renewal and adaptation. 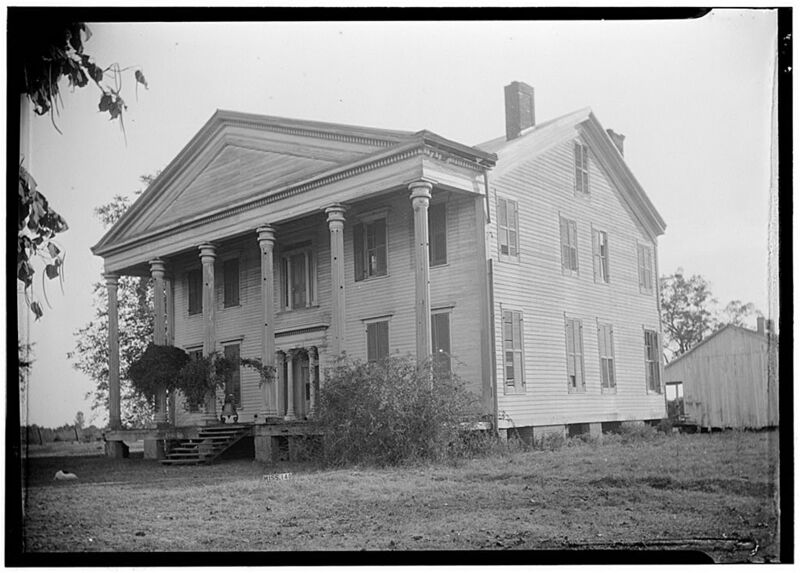 The first district hall was built in 1860. A new hall was designed by Thomas Frost and added behind the original in 1880. 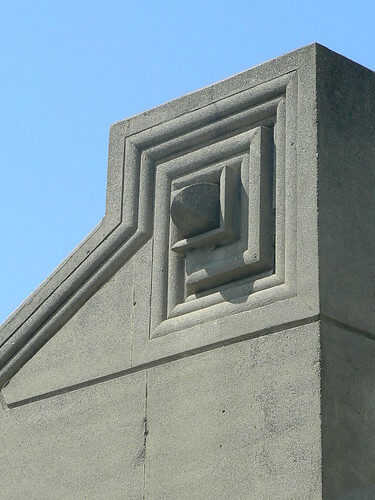 Then in 1936 the stone portico was removed and the building refaced in Art Deco style to the design of Christopher Smith. 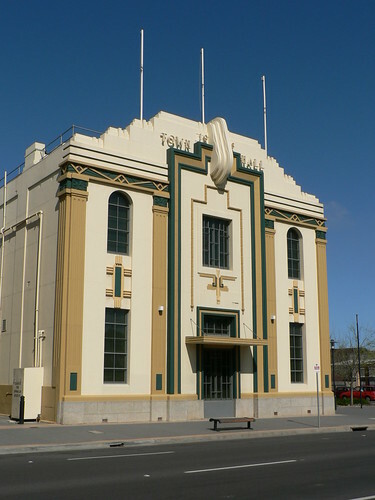 Smith designed several Adelaide cinemas and at this time a cinema was also included as part of the town hall. Following the amalgamation of the Hindmarsh and Woodville Councils in the 1990s it became the Education Development Centre under the South Australian Department of Education and Children's Services. 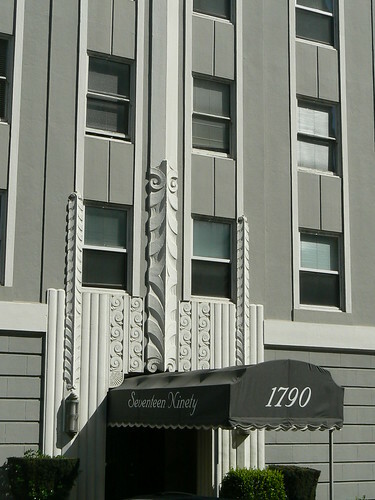 This photo shows the Milner Street entrance. Edwards Stadium is the track and field venue for the University of California - Berkeley. 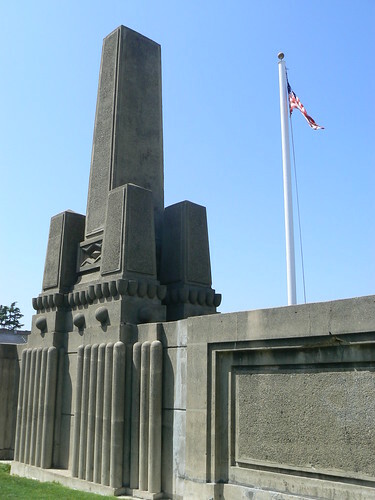 It was designed by Warren C Perry and George Kelham and opened in 1932 just two years after the man it is dedicated to died. 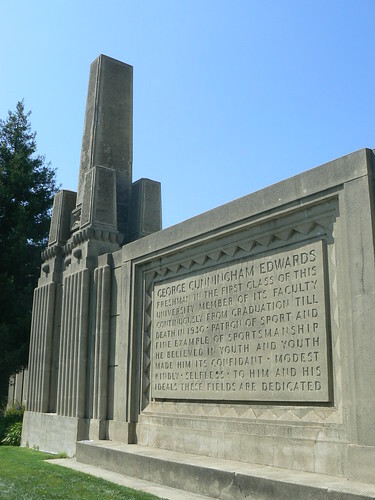 George Cunningham Edwards freshman in the first class of this University. 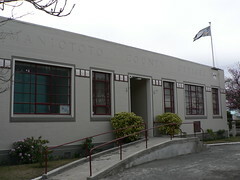 Member of its facility continuously from graduation till death in 1930. Patron of sport and fine example of sportsmanship he believed in youth and youth made him its confidant. Modest, Kindly. Selfless. To him and his ideals these fields are dedicated. The walls are punctuated by several monolithic obelisks, each one surrounded four much smaller obelisks. 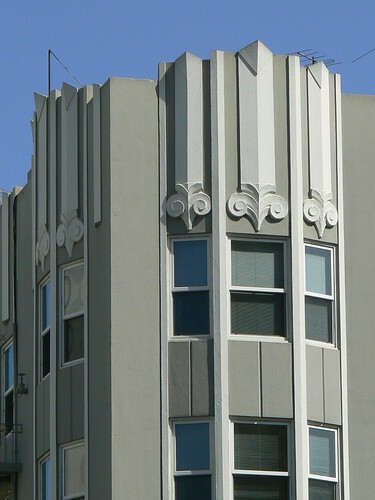 The decoration also includes rounded columns, demispheres and zig-zags. 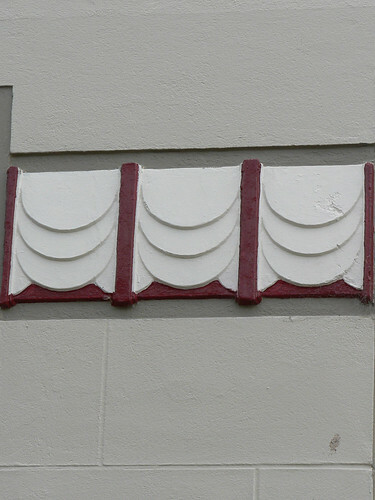 And I particularly liked this decoration on the outside corner of the terraced seating. In 2000, the stadium was upgraded to include a soccer pitch for the University men's and women's teams. The Goldman family contributed money towards the upgrade and the soccer pitch was named Goldman Field in honour of Richard Samuel Goldman who had competed for the California Golden Bears under Walter M Christie, the legendary Cal track and field coach from 1900 to 1932. 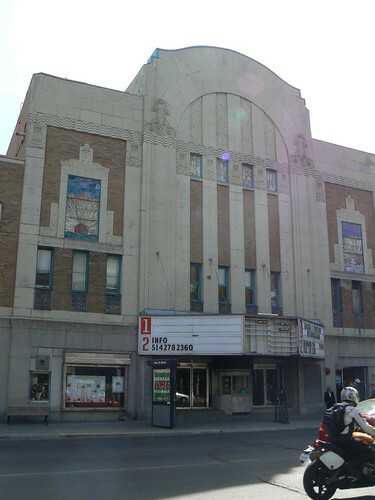 This is the Château Theatre in Montreal. 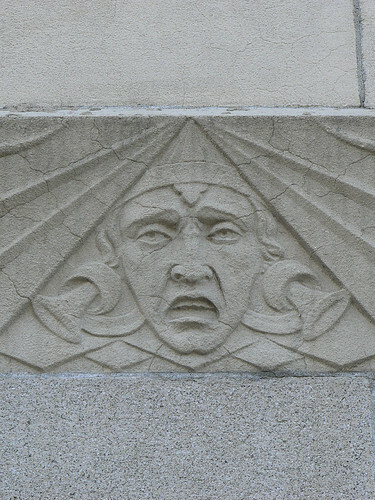 It was built in 1931 René Charbonneau as the main architect working with designers Emmanuel Briffa on the interior and Joseph Guardo on the exterior. 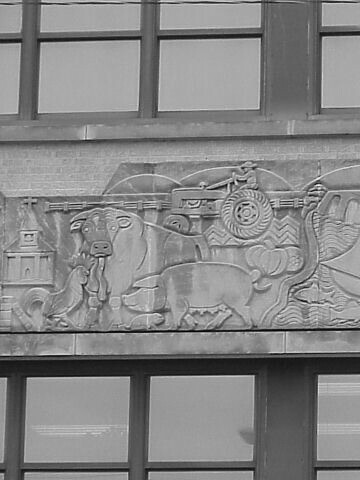 The central section of the facade features an arched form flanked by stone figures and including long-necked waterbirds, stylised floral decoration and a horizontal band with a wave motif. 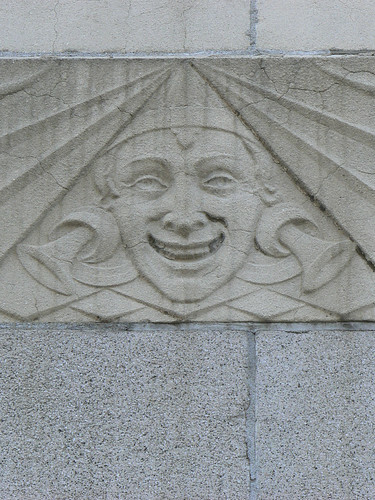 There is minimal decoration on the side of the building but it does include reliefs of Comedy and Tragedy masks representative motifs of the performing arts. 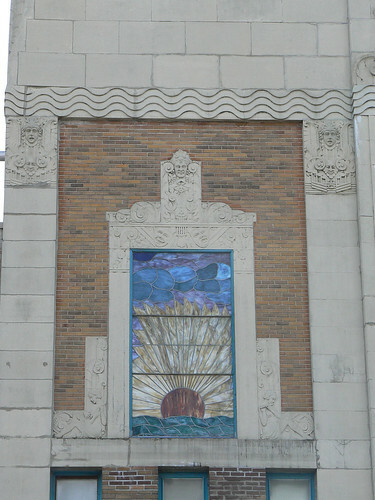 Just about the only colour on the facade is in the form of two large stained-glass windows with a rising or setting sun. 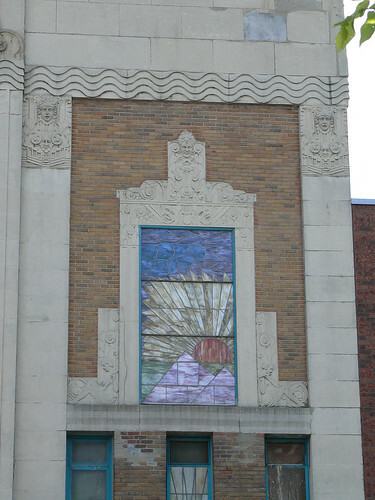 I like to think that even through Emmanuel Briffa worked on the interior of this theatre he may have brought some Egyptian inspiration from his work several years early on another Montreal cinema, the Empress Theatre, and influenced the design of these windows. The window on the left could show a rising sun against a seascape but the other window, to my mind, is a setting sun against the Giza pyramids. Egyptians considered the west, where the sun sets, as the realm of the dead and sited their pyramids and tombs accordingly. 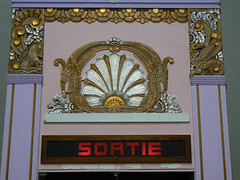 Even if Briffa did not influence the design of the exterior of the Chateau Theatre, his work on the interior is glorious. 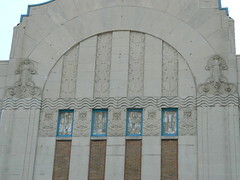 This is some of the detail from the foyer. It is rich in decoration whereever you look. 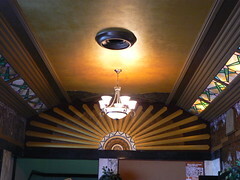 From the stylised sunburst to the stained glass built into the cornice and the central lamp fitting. I'm not sure what the dark disk in the ceiling is, perhaps a vent of the remains of an earlier light fitting. Even so it has a quality look to it. 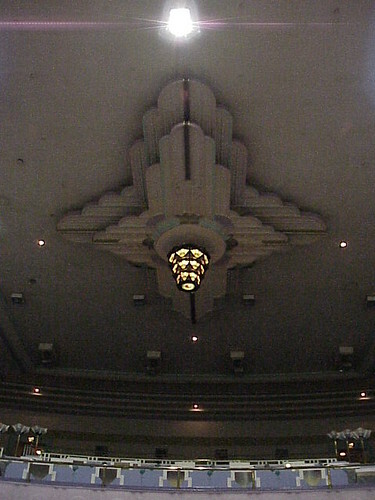 The detail above the exit of the main auditorium shows some more of the rich decoration in this theatre. 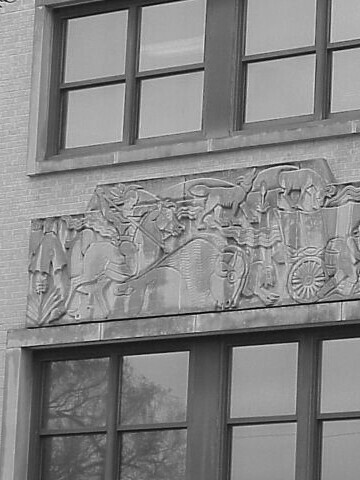 Here you can see griffins an perhaps a winged horse alongside stylised floral forms. I don't usually post photos with people in them but this one at the Château shows what we are like when we tour a building during a World Congress on Art Deco. And I had fun picking out some people. Our guides Jack & Jean-Yves. Colin from Montreal, Lynley from Melbourne, Peter from Sydney, Mick from Asheville, Rory from Los Angeles, Bob from Dublin, Robyn from Melbourne, Jo from London, Jan from Sydney and Mary from Dublin. 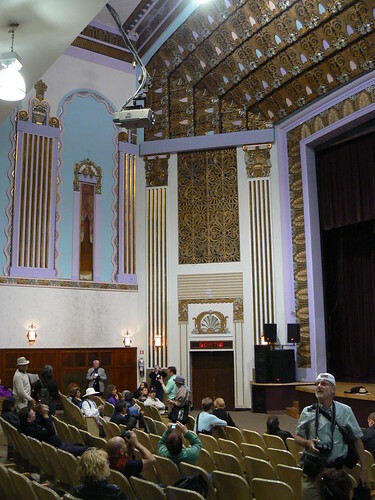 But forget about the people and have a look at the decoration on the wall and proscenium arch of this glorious theatre. 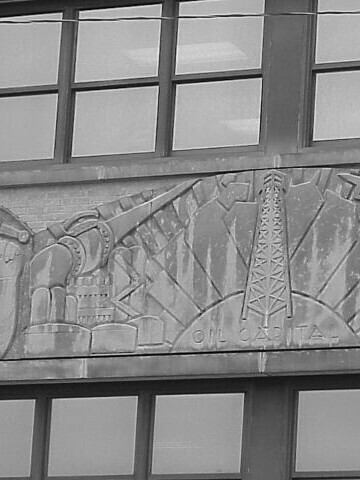 This is the frieze on the Chamber of Commerce Building in Tulsa, OK. 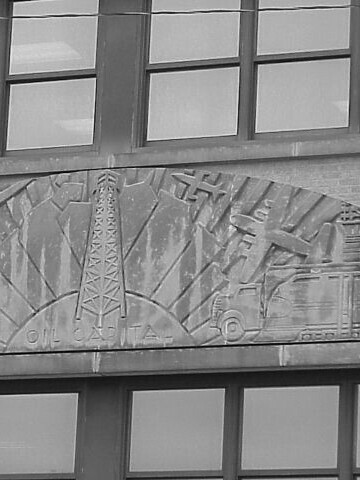 It shows items associated with local commerce such as agriculture and oil production. When I was in Miami in 2005 not everything was perfect and well maintained. 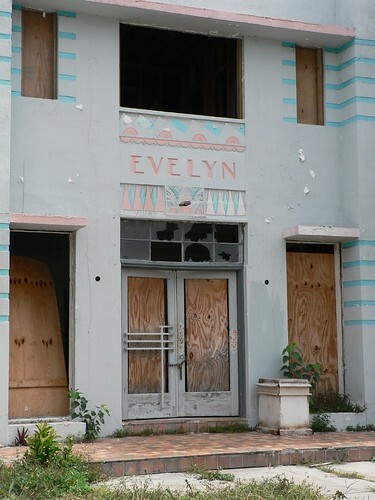 A lot was, but I wonder what has happened to Evelyn in the past five years? 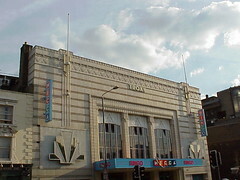 This is the former Troxy Cinema in Stepney, London during its days as a Mecca bingo hall. It stopped as a bingo venue around 2005 and, renovated, it now serves as a concert, sports and events venue. 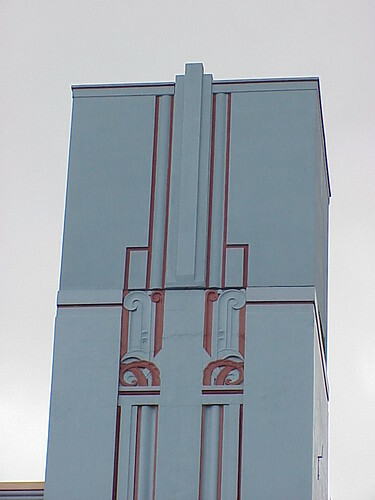 The cinema was designed by George Coles and openned in September 1933 but was closed in 1960 as a lot of the local population had been relocated due to war damage and subsequent slum clearance. After lying vacant for three years it became the London Opera Centre and was used by the Royal Opera House in Covent Garden to construct sets and as their rehearsal space. 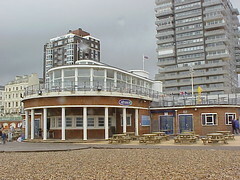 In the 1990s it became a bingo hall and remained so for around 15 years. 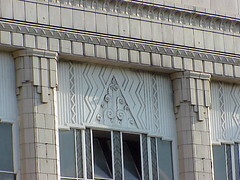 This photo shows one of the three identical decorative panels above the large windows on the front of the cinema. They have been painted over as this 1961 photo posted on Flickr by dusashenka shows them as gold on a black background. 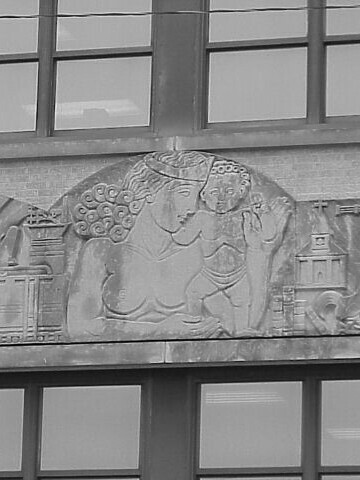 Many of the interior elements seemed to be intact (in 2000-01) including this wonderful (and grainy, sorry!) ceiling light fitting. 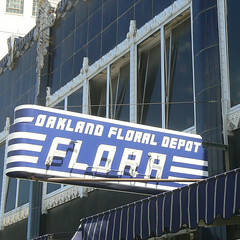 The old Oakland Floral Depot at 1900 Telegraph Avenue, designed by Albert Elvers and dating from 1931, is now a restaurant called Flora. 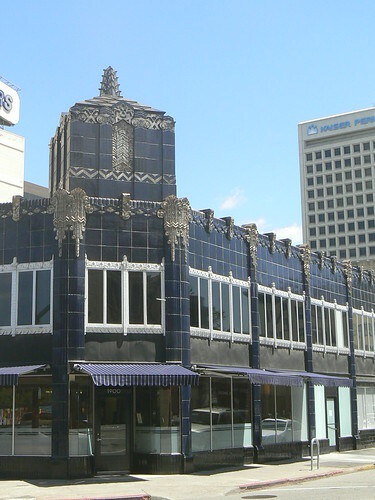 It is a glorious building covered with cobalt blue tiles and silver Art Deco decorative flourishes. The corner tower is stunning. It takes quite a few minutes of concentrated effort to absorb all the decoration. 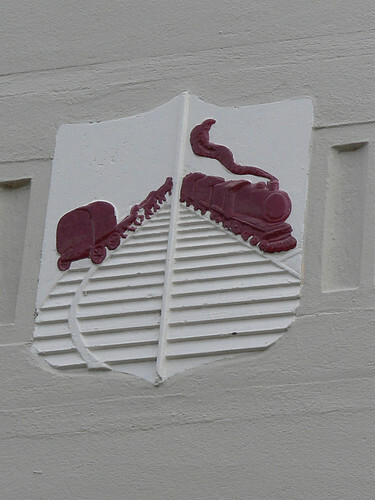 I particularly like the band of chevrons about half-way up. 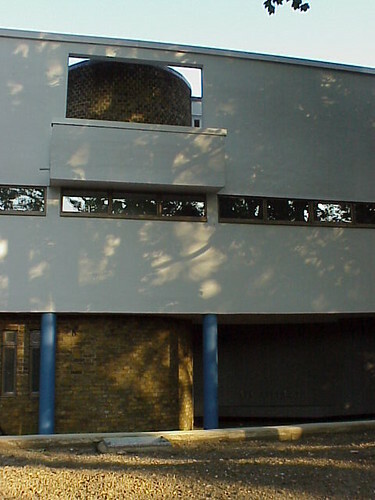 The look of Six Pillars, a Modernist house in Dulwich, South London belies its age. It looks like it could have been built yesterday but I took these photos ten years ago and the house was already over sixty-five years old then. Six Pillars was constructed from 1932-34 for Rev J H Leakey, headmaster of Dulwich College Preparatory School, and his wife. 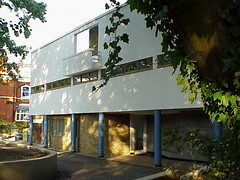 Architect, Valentine Harding secured the commission for Six Pillars and worked as lead designer on the project through Berthold Lubetkin's architectural firm Tecton. Harding maintained a good relationship with the Leakeys and later worked, through them, on other projects for the preparatory school. 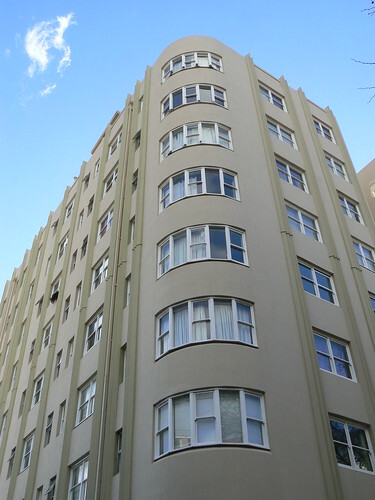 The Pacific Heights area of San Francisco is packed with Art Deco apartments like this on at 1790 Jackson Street. 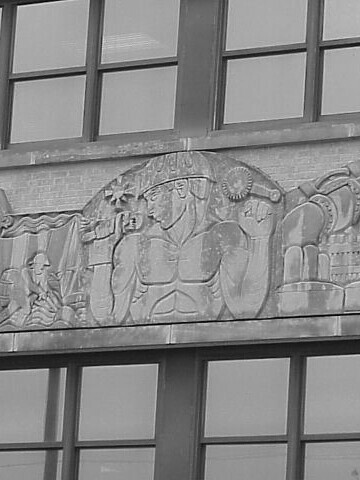 It was designed in 1940 by Herman C Baumann and demonstrates the quality and areas of decoration of many of the residential buildings in these streets. 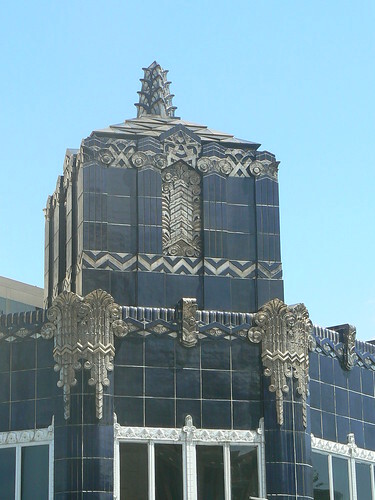 The main decoration is along the roofline with a usually more ornate entrance at street level. 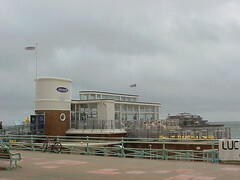 This is the view from the beach of Alfresco Restaurant in Brighton. A wonderful location looking out on the historic piers and the English Channel. The address is given as Milkmaid Pavilion which conjures up more questions in my mind than answers. I presume it was a dressing pavilion for bathers ... but there must be some story behind the Milkmaid name. From the Upper Esplanade the building looks like a ship cruising into shore. 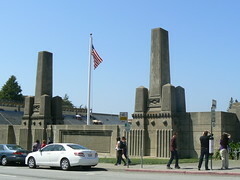 The outside terraces are bounded by metal railings and the tower marking the entrance has porthole windows and a flagpole. I'm sure as the Alfresco name suggests, this is a lovely place to sit out for a meal or a drink on a sunny English summer afternoon.